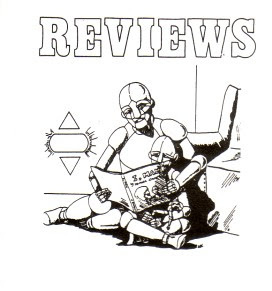 First issue to be accompanied by the Auguries Review Magazine: No.1 – 16 pages of reviews; cover by Nik Morton and Gallery illustration by Russell Morgan. I shamefacedly pinched the idea of a separate reviews booklet from Dave W Hughes, editor of WORKS. Typesetting & printing by Chris Reed, BBR (Back Brain Recluse). 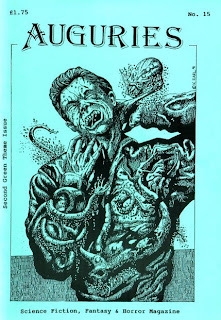 Label now read on the cover: ‘Science Fiction, Fanasy & Horror Magazine’, which stayed until the end. Cover – Kerry Earl, illustrating the story by Cleveland W Gibson. The second Green Theme issue. Interior illustrations by Kerry Earl, Russell Morgan, Dallas Goffin and Mark le Fevre.